We are proud to introduce the SMACK 16,000,000! 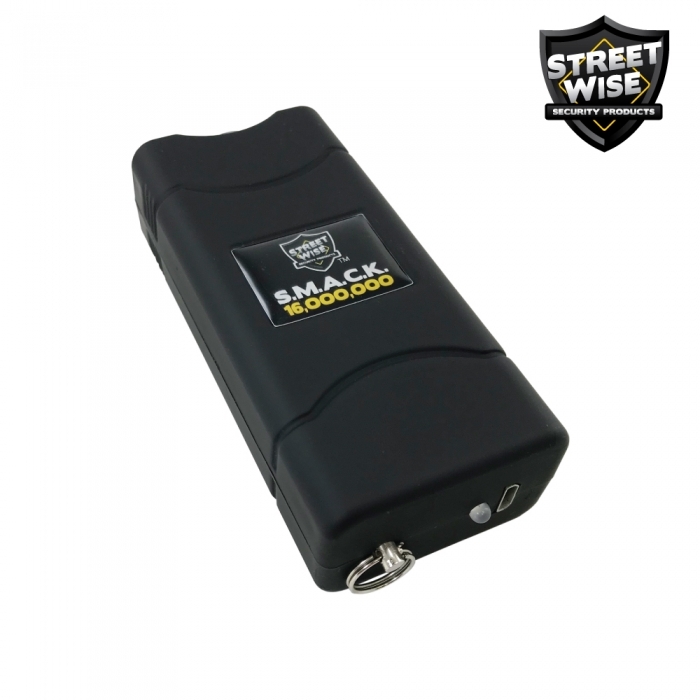 Small But More Powerful – Having half the size of a standard stun gun, the SMACK 16,000,000 self-defense equipment has more power than most models of stun guns on the market today. 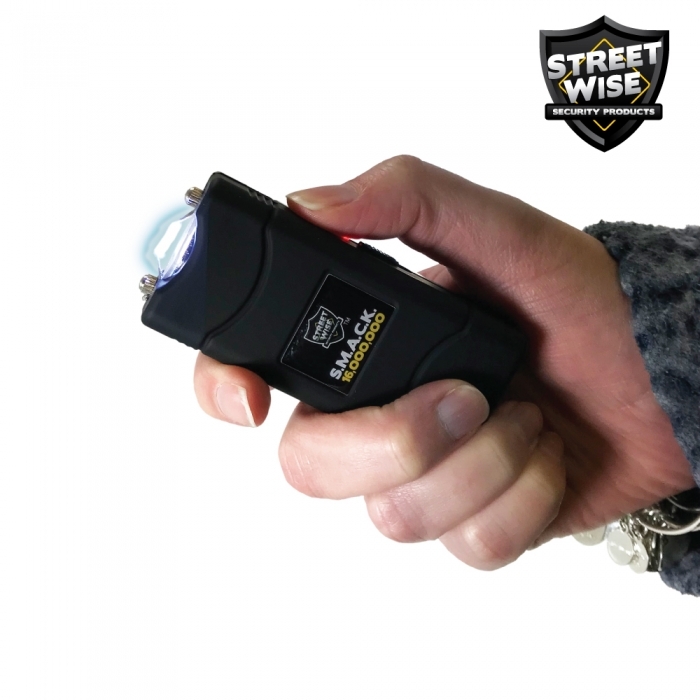 Just test firing this self-defense stun gun into the air is often enough to stop an attacker. 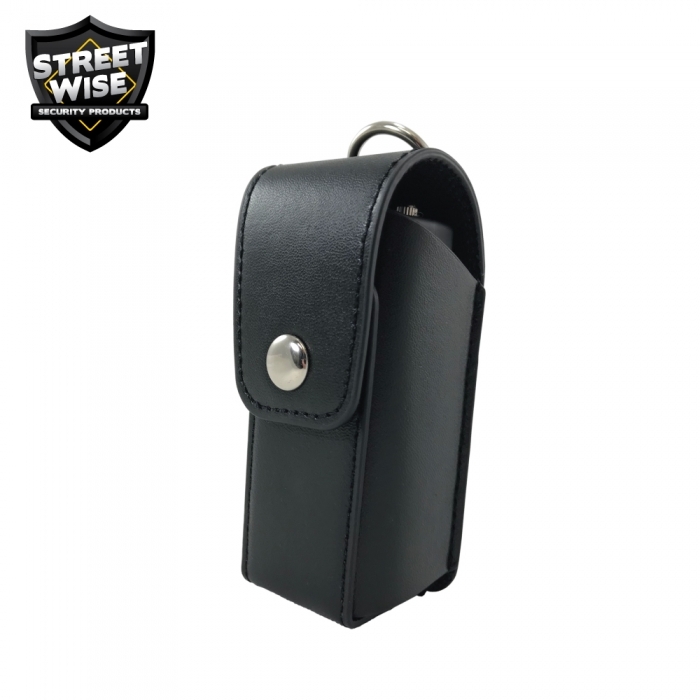 Attaches to Your Keys – You will have your personal protection weapon in your hand when walking to your car or home and will be ready when the need arises to protect yourself. Easy to Conceal – Can be concealed even in the palm of your hand. Easy USB cord charging – The included USB cord plugs into the bottom of the unit. The other end can go into a USB port on a computer or a block charger (not included). Complete charging instructions enclosed. 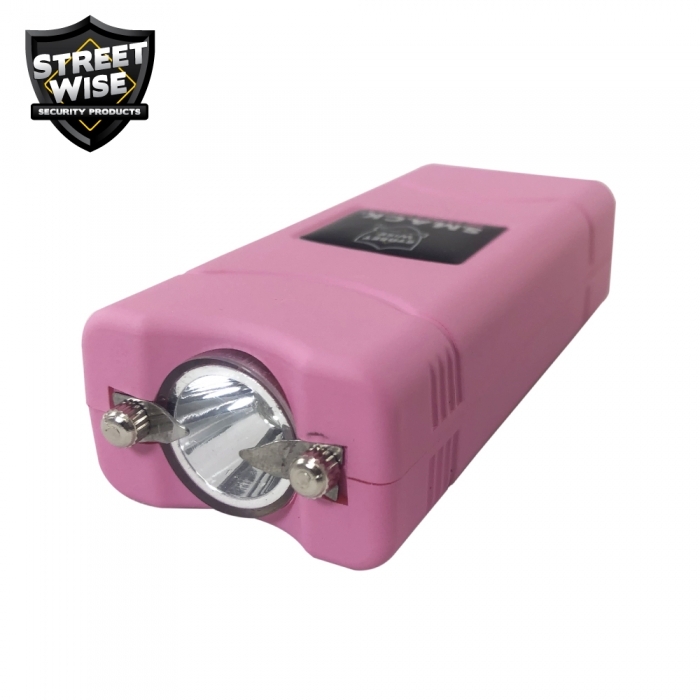 Bright LED Flashlight – The LED flashlight offers a convenient light source, which eliminates the need to carry a separate torch. 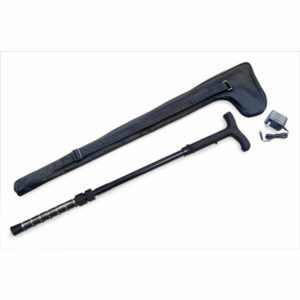 Safety Switch – Two levels of safety have been built in to prevent accidental discharge. 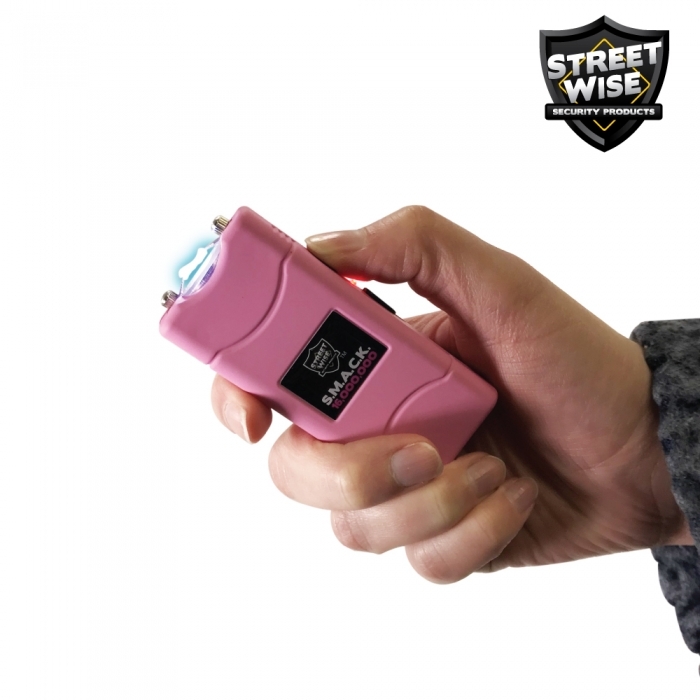 The stun gun will only operate if the safety switch is in the ON position and the stun activation button is pressed. 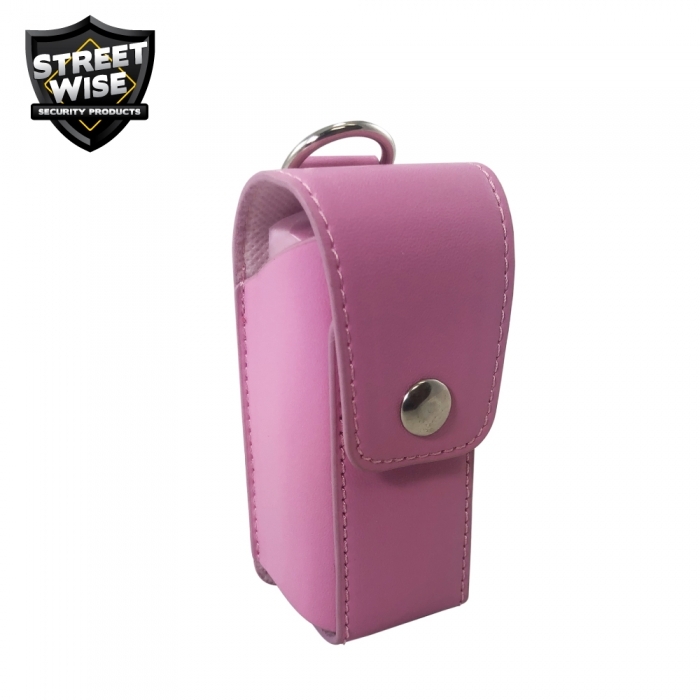 Holster Included – The personal defense weapon can be carried easily in your pocket or purse but can also be taken with the included stylish holster. 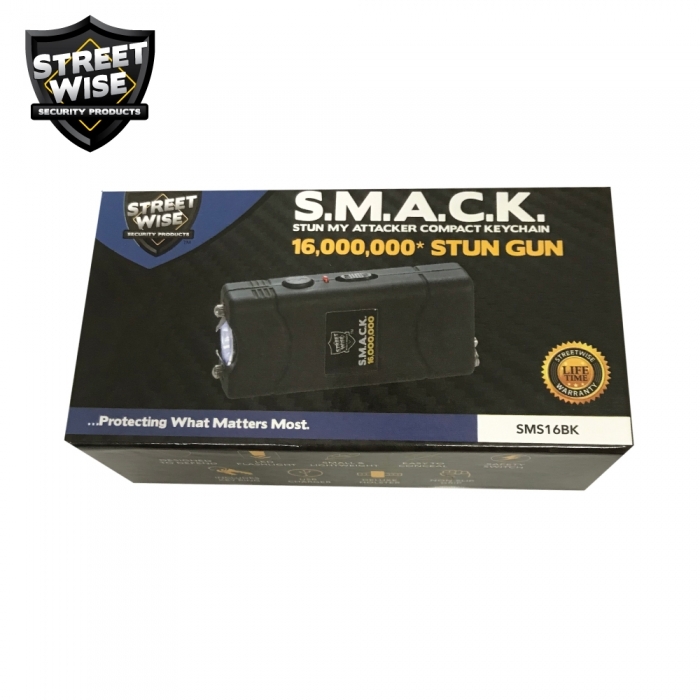 Lifetime Warranty – The SMACK 16,000,000 Stun Gun is made of the highest quality components and comes with a lifetime warranty. 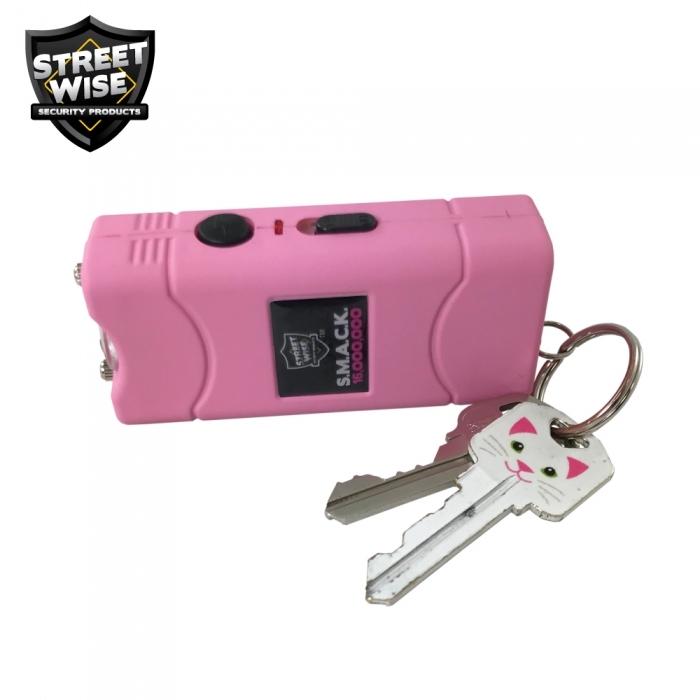 We took something great on our SMACK 6,000,000 stun gun and made it even better! 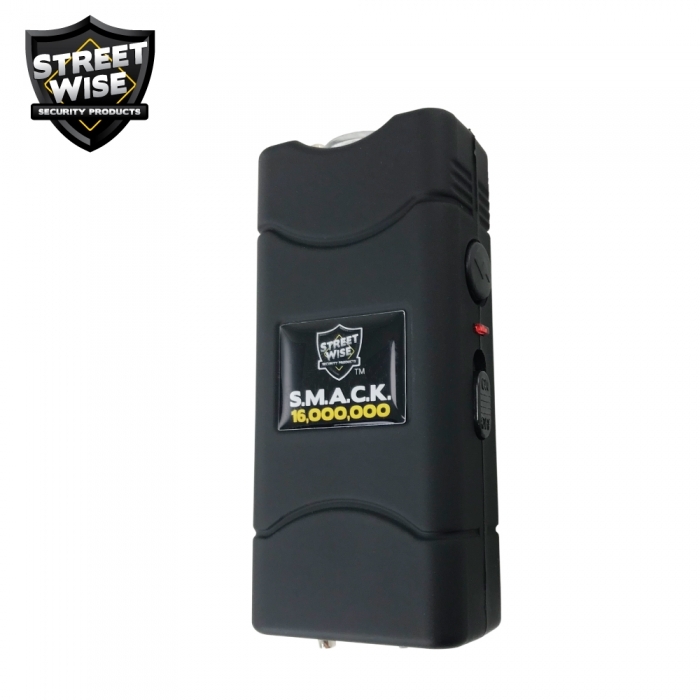 For many years now, the SMACK 6,000,000 self-defense product has been a tremendous seller. With the help of our customers’ feedback, we found ways to improve it. We made it smaller, less expensive, easier to discharge and more powerful! 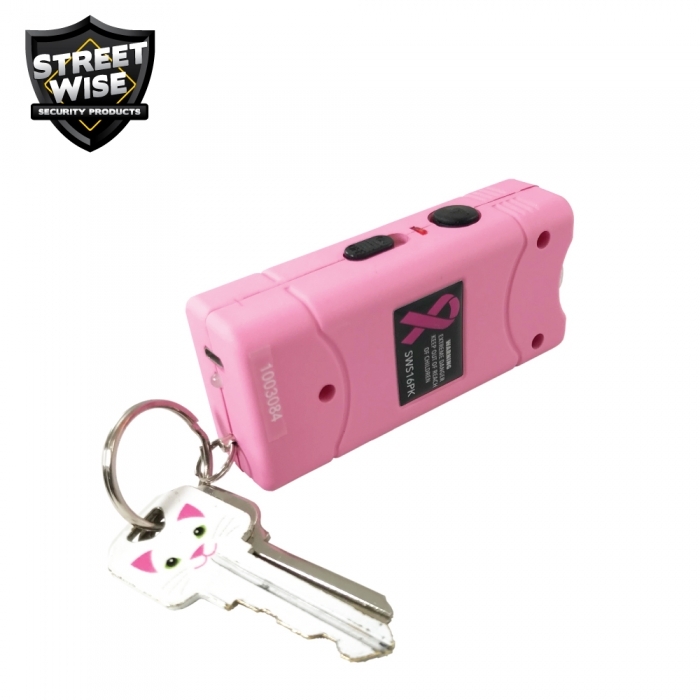 Self-defense item is now as close as your keys. 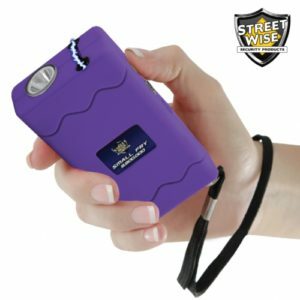 The new and improved Stun My Attacker Compact Keychain (SMACK) 16,000,000 Stun Gun is smaller than its predecessor but more powerful. 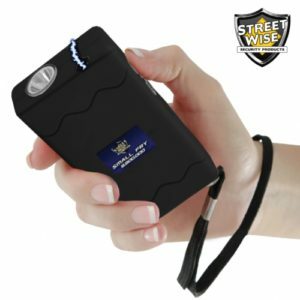 This fantastic electric stun gun is a little over 3 inches x 1.25 inches x .75 inches (about the same size as a keychain pepper spray). 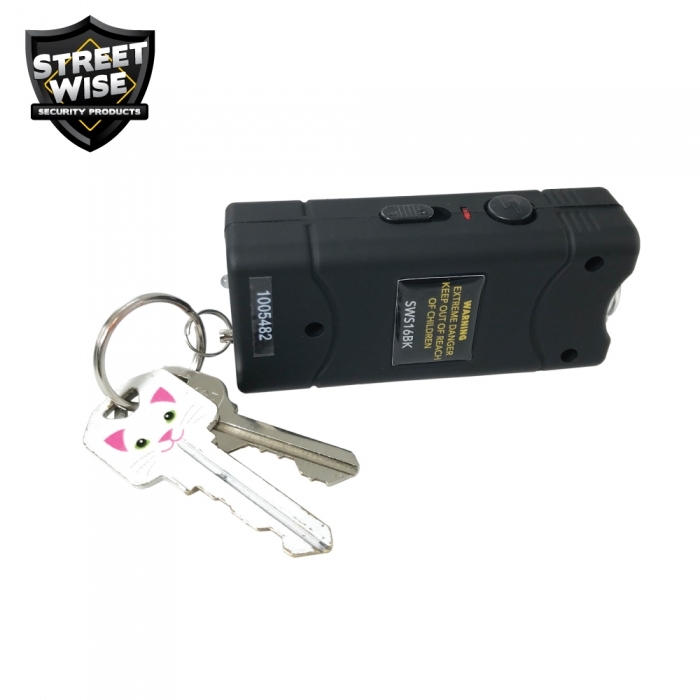 It uses high-quality components to offer more power than most stun guns on the market today. 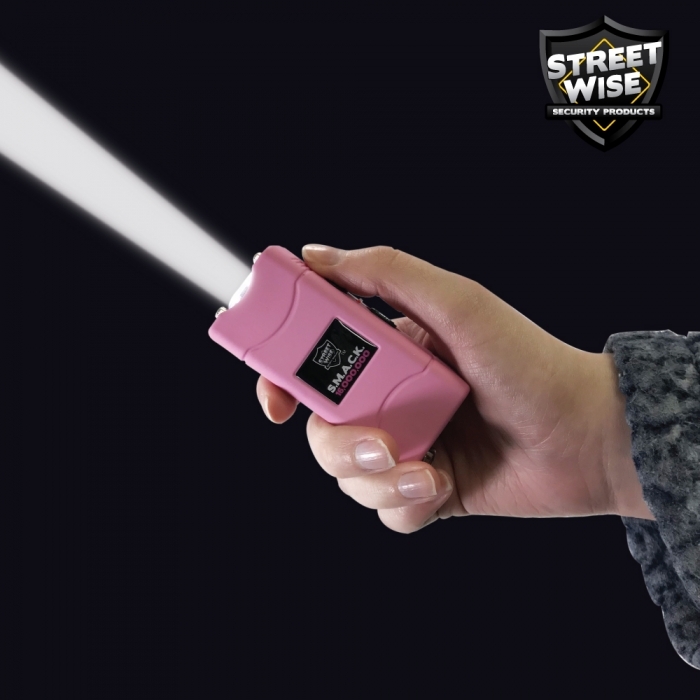 The bright light can be used as a light source at night or shined in the eyes of an attacker. 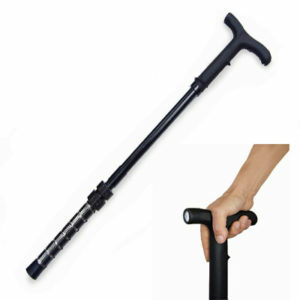 The self-protection weapon also makes an intimidating sound when activated that would make would-be attackers think twice of their evil plans against you. If the light and sound don’t stop your attacker, a jolt from the SMACK 16,000,000 stun gun certainly will! 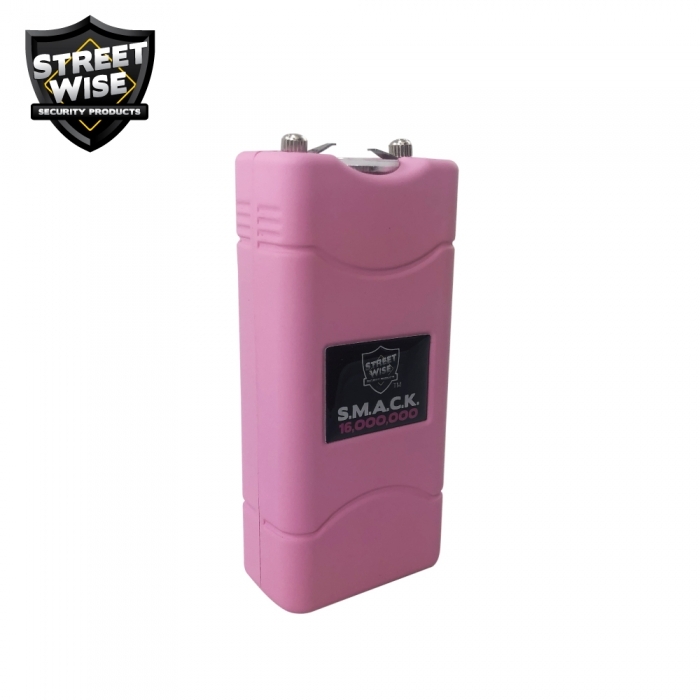 The SMACK self-defense weapon comes with the USB cord for easy recharging. Plug into the USB port of any computer or use a block charger (not included).